Playa Bonita Ecohotel i Santa Marta, Colombia: Reservér nu! 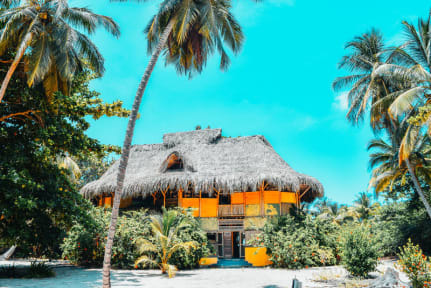 Playa Bonita Ecohotel is a beautiful hotel eco-cabins by the virgin coasts of the Caribbean in Colombia, surrounded by astonishing nature and different kind of birds. We have a restaurant where you can enjoy one of the best experiences in gastronomy with specialities in sea food, as well as a variety of meats, pastas, rices and vegetarian meals. You can find us at 46 km from the city of Santa Marta on the way to Rioacha; 10 minutes from the main entrance to the Parque Nacional Tayrona and 10 minutes from the cabins in Buritaca. All of our cabins are built in bamboo with palm tree ceilings and private bathrooms. We are known to be an ecological hotel without any TV, WiFi or air conditioning (we do have ceiling or floor fans). We also provide clean linens and basic toiletries and amenities.